What Wikipedia says is a large industrial town, but it is not only the industries that keeps up the fame of this city, there is a lot more to it than you think…we often tend to ignore the historical, cultural and the ethical knots tied to it. There are numerous places that reflect the diverse spirit of this city. We need to immerse ourselves in the well-recounted allurements of Ludhiana’s salubrious expanses and find ourselves reasons aplenty to return again and again to this city’s serendipitous slices. One such place where tranquility meets beauty is the Satluj riverside. As I read somewhere that sometimes its nice to take off-to a journey into yourself, to disconnect from oneself, to dive inwards and see the world anew. 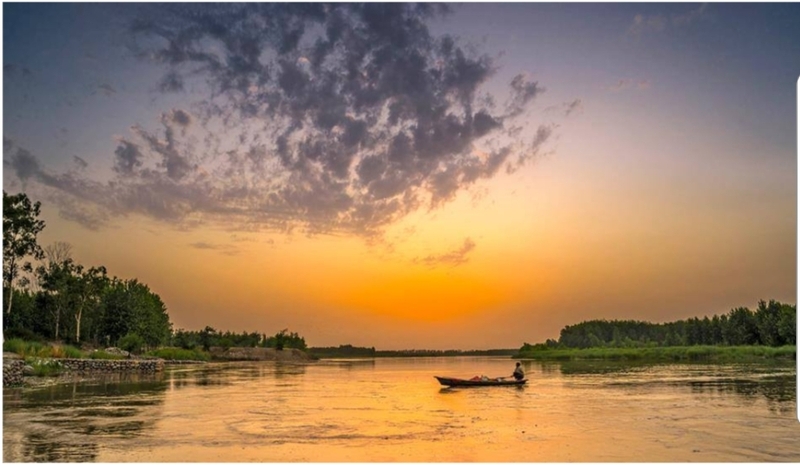 The Satluj river side is a perfect place for such a paradise. That’s the thing about the river-nothing is scripted the boundaries are hazy and the wildlife is unafraid. The cyclists of Ludhiana have found their inner peace in that unique environ which also acts as a stunning backdrop for the divine radiance of the river. Sitting there, looking at the lush green sky punching trees emblazon their reflections onto the still river and feeling the wind howl like a wounded animal over the golden fields gives the heart a breezy hug. The summons of this river’s multiple charms are becoming increasingly irresistible for the people living in the urban landscapes of Ludhiana. The sweet embrace of the natural vistas, the promise of the healing air and the astounding mystique of the water is waiting for you. By allowing the adventure vibe to seep inside you, you are unfolding the wings that were tucked inside since birth. So pack your backpacks, pull up your cycles and ride away to the road to heaven. What a rideful experience , while reading it I had! What bombastic choice of selective and apt vocabulary ! For a friction of second, one would forget a young girl delving deep inside , penning her heart out and leading all towards road to heaven! What a rideful experience I had while reading!How stupendously fabulous selection of vocabulary !For a friction of second I forgot a young girl delving deep , penning her heart out and leading all to heavenly ride!